We can’t brag on our vendors enough, and today we’re spotlighting Thali and Maya’s. One specializes in serving up family dishes from Northern India, and the other is sharing space to do the same with southern Indian fare. You know, the best of both worlds. Thali – roughly translated as “combination plate” – are found all over India, featuring an array of balanced flavors and amazing spices. 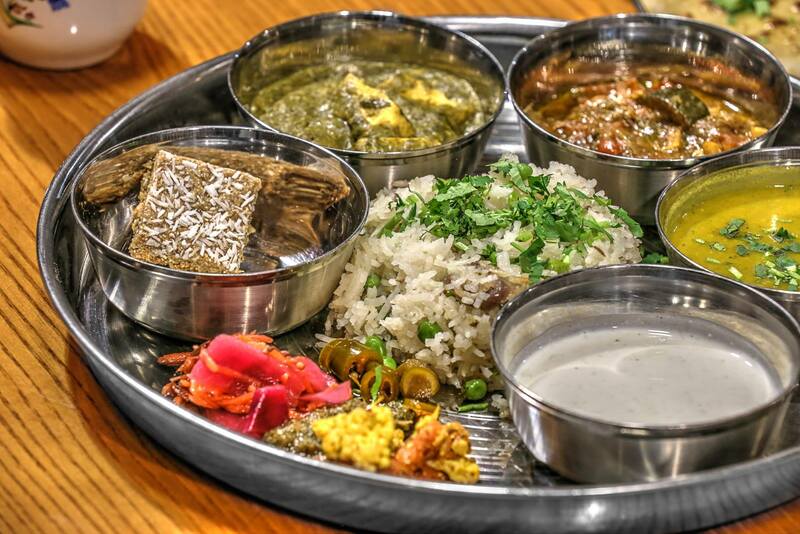 At Thali, they’re serving up a refined version of the same, with all kinds of veggie curries, lentil dishes, raita, rice pilaf, chutney, handmade chapatis, and, of course, dessert! The recipes come from owner Serj Singh’s family, and they’ve run the gauntlet of generations of palates. Authentic, satisfying, and a true family affair – you’ll even see Serj’s retired parents flipping chapatis. Oh, one more thing – Thali is 100 percent vegetarian and fully organic. The restaurant is proud to partner with certified local farms and sources from as many local producers as it possibly can. Sounds pretty amazing, right? Thali opens its doors every Thursday, Friday, Saturday and Sunday for dinner, with set menus and a set price. Easy, peasy. On the southern side of things is Maya’s South Indian Cuisine, named for owner Anitha Pagidi’s little girl. This is where Anitha is on a mission to show Reno that Indian food isn’t limited to curries. Come in for the fermented rice and puffed lentil fritters, pillowy poori bread, dosa crepes, rice and lentil dumplings known as kuzhi paniyaram, and other secret family recipes, which can all be combined into platters with two to four tantalizing items. Maya’s shares the organic, vegetarian, and vegan focus of Thali, the space it uses to serve lunch Thursday through Sunday from 10 am to 2 pm. And that’s awesome, because it means you can enjoy southern Indian for lunch and come back a northern Indian dinner – all in the same place.